♥ Cook 2 cups of rice in the rice cooker, or otherwise on the stove – it’s a much quicker way to cook rice if you’re short on time! Wash the rice in a saucepan which has a lid – add 1.5 cups room temperature filtered water for 1 cup of rice. A rule of thumb (hehe) – the height of water between the rice and the water level should be around the same as the top joint of your index finger. Cook the rice on high heat until the water is just about level with the rice, then cover the pan and turn to the lowest possible heat. Cook for a further 10 minutes, and presto – perfect rice! ♥ Zest and then juice the lemon, peel and grate the ginger. In a large frying pan on low heat, add the oil and butter until foaming, then add the sliced shallots, cook until softened (around 3 minutes). Add the lemon zest, juice, ginger, tumeric, salt and pepper and cook into a golden paste. 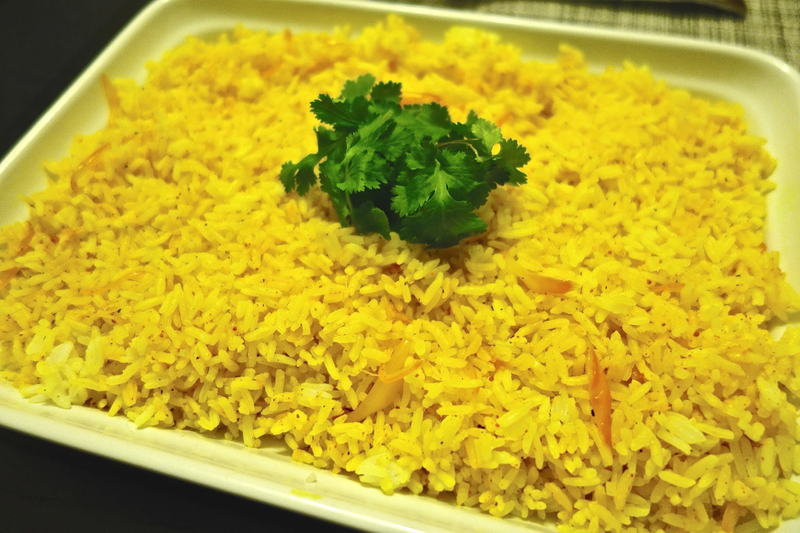 ♥ Add the rice to the pan and stir thoroughly until all of the rice is yellow. It’s easier to add the rice in two batches. Serve with a bunch of coriander on top for contrasting colour. I made this dish for the first time with whole sea bass baked in a spiced yoghurt and it was pretty awesome! It would go well with any Indian-inspired dish, or curry.